The mercy of God is not an invitation to “spiritual laziness”, but requires a sincere and prompt response from those who want to grow in holiness, Pope Francis said on Sunday. Source: CNA. “Despite the barrenness which sometimes marks our existence, God has patience and offers us the possibility of changing and making progress on the path of good,” the Pope said. In his address before the Angelus, the Pope reflected on the call to conversion, as depicted in the parable of the fig tree in the day’s Gospel. In the parable, a man decides to cut down a fig tree in his vineyard because it has not produced any fruit in three years, and he does not want to expend the resources of the land on this barren tree. But when the man speaks to the farmer who works in the vineyard about cutting down the tree, the farmer asks him to wait one year more and that during that time, he will cultivate and fertilise the land around the fig tree so that it may have the possibility to bear fruit in the future. 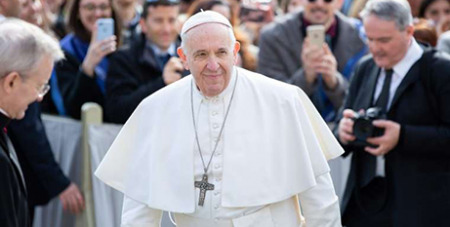 Francis explained the owner of the land represents God the Father, and the farmer represents Jesus, while the fig tree “is a symbol of indifferent and arid humanity,” he said. Like the farmer, Jesus intervenes on behalf of humanity, asking for a little more time for “the fruits of love and justice” to grow.